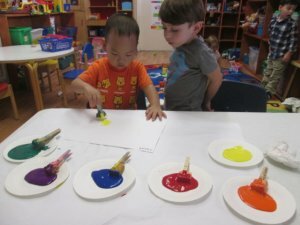 Theme of the week was finger painting, sponge painting, and reviewing colors. We had science class, Spanish class, and music class this week! Special snack this week was strawberries and blueberries. Reminder Family Night is Tuesday September 19th from 6:15-7:30. See sign-up sheet is outside our classroom.